I’ve been working on a new pattern the last few months, but our matron asked that I go back and make a few modifications to this one I finished earlier in the year. Working with this pattern again makes me happy. I was a little nervous that I wouldn’t remember enough of the pattern, but a few minutes of study and it all came back. It’s like dancing to a familiar tune. 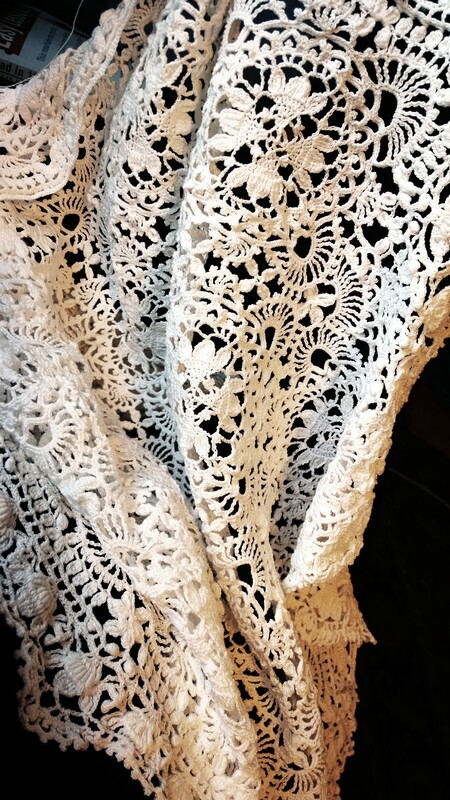 Thank you for posting your pictures and stories….I see this beautiful lace that reminds me of my “home Temple”..the Los Angeles Temple….such sweet and strong emotions go with seeing that beautiful lace, artistic and made with pure love. Is this beautiful pattern available? You do amazing work! Shara-Dee, This one has been copied by women who sit beside me, but I have never been able to write it out in a concise way that makes sense to most lacemakers.